This makes me think of all those presentations where someone stands in front of the room and reads power points. You think we can’t count? How many cheese pieces do you need for a 6 inch sub? A 12 inch sub? a giant 6 foot sub? I bet students might be interested. I guess it’s not linear, and it’s not quite the same task, but whatever, it’s awesome. What about some variation on this problem, featured in an earlier post? Split up the class into groups, give them a different pattern in a manila envelope, and have them text each other instructions on how to reconstruct the pattern in their own drawings. Another idea: just ask, how many bricks would be in the 10th row? The 100th? The 1000th? I’m just assuming print here. 1) Take away the “The landscaper is..[blah blah blah]”. As context, it’s pretty weak, and probably pseudo-context. 2) Take away the numbers next to the rows. Let students count it themselves. Now normally I would say students should be able to solve a problem any way they can solve it, and if you wanted them to solve it a certain way, it should be the only obvious choice. However I’m assuming here that both explicit and recursive formulas are outcomes that need to be covered in this question. No need to constrain outcomes. If you ask for the 1000th row, you’ll likely need the explicit form. Or, if the student uses a script or something, they’re using the recursive form. Harel’s point (I’m speculating) is that there’s no intellectual need for the two forms. The textbook treats them as ends, not as means to another more problem-laden end. Can I ask about the learning goal of the task? Is it to discover a distinction between recursive and explicit descriptions of sequences? Is it to practice writing formulas using patterns?Knowing what students should understand as a result of engaging in the task would help in the redesign/improvement. Also, I’m compelled to read more about “intellectual need”. For me, math is engaging and fun when it’s intellectually satisfying, not necessarily when it’s about some activity that I might be interested in or about something “real” like doubling a recipe (who cares how much sugar? Just use your scoop twice.). I suspect this is true of lots of students. Bowen’s bowling ball pyramid made me consider what this might look like with billiard balls if the opening arrangement was extended. Some have already suggested finding the number of balls in the nth row. You could ask what row certain balls fall in. How does the total number of billiard balls change if you are allowed to start in rows other than 1 (i.e. remove rows as well as add). Going to the idea of the recursive formula- students might benefit from using a spreadsheet to have the computer do the heavy lifting, they have to learn how to get the computer to do the calculation. Once there, they could explore how they might use the input value to get the output value rather than going through the process recursively. 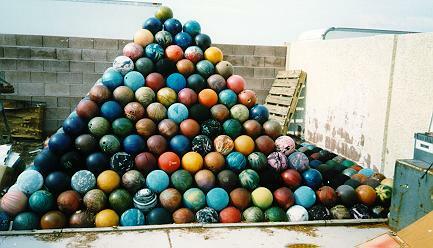 “Which number of balls COULD you make this type of pyramid with? …and a host of other interesting follow-ups and extensions. The question just seems more intriguing and perplexing to me. *where x is some ‘not-so-arbitrary’ number of balls. Most students find explicit formulas much more intuitive. Even when programming, it’s really not until students already have a grasp of recursion and are learning more complex topics such as sort routines or functional programming that the recursive method becomes easier. For the high school level series and patterns, it’s not likely students would use recursion to solve the problem unless the teacher forced them to use it. Regarding using the recursive formula, I can’t think of a single case where a recursive formula is easier to use than an explicit formula in solving these types of problems. What’s the next term in this arithmetic sequence? You’d reach for the explicit formula? I and most students I’ve worked with will treat it recursively. It’s only when you ask for the 2012th term that recursion starts to look really unattractive. There are also many (many, many, etc.) sequences defined recursively for which no explicit formula is known. Before reading through others’ replies my thought was to provide students with envelopes of black and white tiles, ask them to create a tiling design and provide an explanation for customers to know how many of each colour tile they should buy. I wonder how many would create “linear” patterns in rows and how many would go for a “radial” pattern? Also, how many would describe their instructions in words and how many would use symbols? I’m going to backtrack a bit here. When I was thinking of recursion, I was thinking of it in the computer science sense, where it’s usually referred to solving a problem top-down rather than bottom-up. Same “recursive formula” either way you solve it though. You’re both right that many sequences do not have explicit formulas and students would use a recursive formula to solve most sequences where an explicit formula is not obvious. @James, Word. Recursion in CS took me a lot of head-thumping. 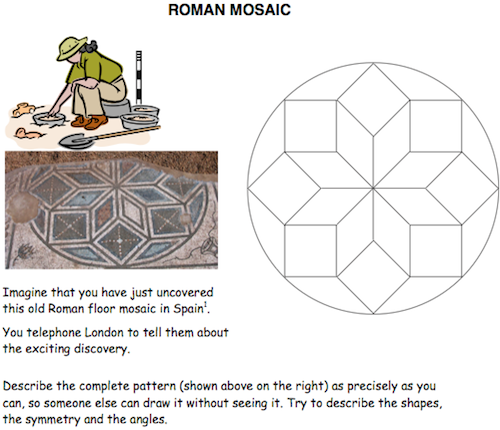 I think it would be more interesting, and actually have something to do with brick patterns, if you provide trapezoidal areas with given dimensions, a couple or three different sized brick options, and ask the students to try and create designs like that shown. If it isn’t possible, they need to provide the specifications for a new brick of reasonable size that would work. Obviously you want to move towards very large trapezoidal areas requiring custom bricks. 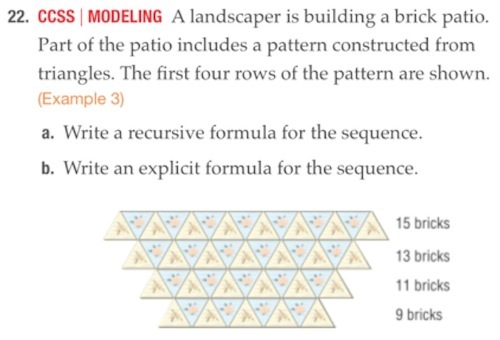 I disagree that an explicit formula is needed for 1000 bricks. I add 2 bricks per row. So add 999 x 2 to the first row. Many kids think and do work this way because it is much simpler and more natural than writing out a formula and plugging 1000 into the formula. Again, asking for an explicit formula in this question is sending the message that math complicates something that is actually fairly simple. Have you seen the Wii game of bowling where you practice starting with pins then after each bowl another row is added on? – then you can ask questions like “when will I be trying to knock down a total of 101 pins?” or “after 5 practice bowls, how many pins will be in the last (largest) row?” I knick-named it “Wii love maths”!